" This product is very relaxing and helpful. My first night using it was the best sleep Ive had in a good year. " " Love the variety - gives me an idea of the scents I might like. " A Pur-Sleep product, the CPAP Aromatherapy Basic Starter Pack brings the pleasure and relaxation of genuine essential oils in CPAP therapy. CPAP aromatherapy takes on a new dimension with this starter kit, allowing the customer to easily add CPAP scents to their CPAP therapy regimen in a way that's safe for the machine as well as the customer. The CPAP Aromatherapy Basic Starter Pack comes from PurSleep, a line of holistic CPAP aromatherapy products designed specifically for use with CPAP machines. Simply set up the diffuser in front of the CPAP filter, place a few drops of Essential Oil on the Diffusion Pad and use your CPAP equipment as you normally do. The Pur-Sleep Diffuser lightly scents the air with one of several fragrances as the air is drawn into the CPAP machine. CPAP Aromatherapy allows the sense of smell to help improve emotion, comfort, and compliance. 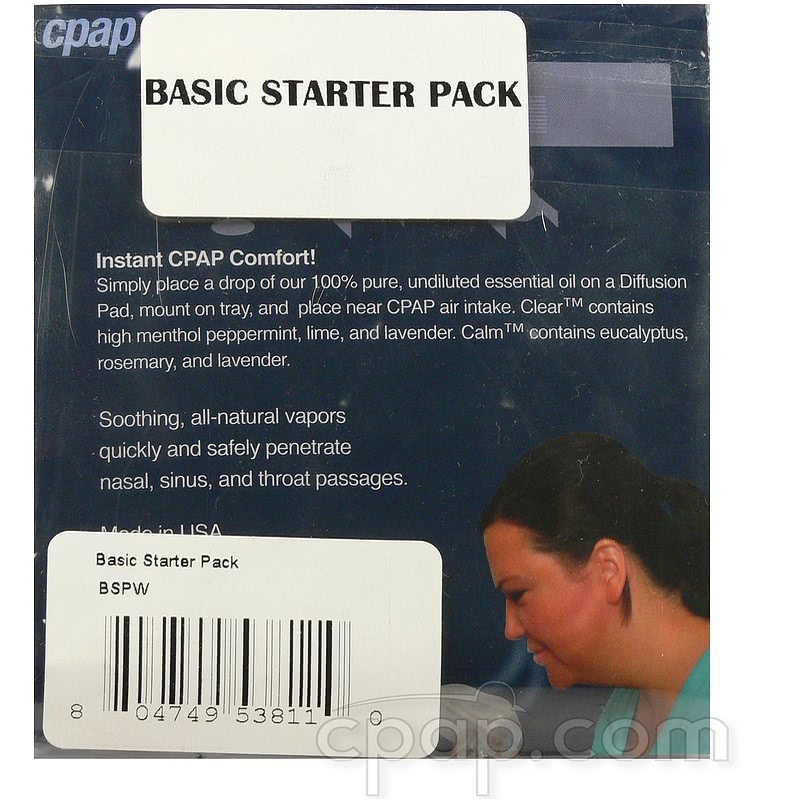 The CPAP Aromatherapy Basic Starter Pack includes everything you need to start experiencing the benefits of Pur-Sleep CPAP Aromatherapy as part of your CPAP therapy regimen. The sense of smell is one of the most acute senses in all of human nature and is so connected to the emotional part of our brains (the limbic system) that our reaction to smell is typically emotional and psychological, not logical. The olfactory sense is much sharper than people realize. Most people can comprehend and identify over 10,000 different scents. Essential oils in CPAP induce strong feelings of calm, comfort, and relaxation. The sense of smell is part of the brain's emotional centers and cognitive distraction (the ability to exclude other distracting stimuli) is an important feature of human olfaction. Unlike the other primary senses, smell is a chemical sense. CPAP scents and CPAP aromatherapy initiates a cascade of physiological and emotional responses that occur whether or not the person is conscious of the presence of any smell. Whether people consciously recognize it or not, the sense of smell works against their CPAP therapy. Research has proven that even very small amounts of plastic compounds, even below conscious detection levels, such as vinyl chloride and styrene (and others emitted by all CPAP equipment) result in high levels of stress, irritation, and anxiety. Essential oils in CPAP therapy may help offset and reduce some of the physical and emotional discomfort of using CPAP therapy. CPAP aromatherapy brings the relaxing and calming benefits of essential oils to your CPAP machine. Have you ever felt claustrophobic using your CPAP machine? Have you ever had a bad smell coming through your CPAP machine? Does your CPAP smell like a shower curtain? Do you want to relax more as you are falling asleep? Have you ever tried to put something in the distilled water of your humidifier chamber only to have it ruin the chamber or not work right for you? If so then Pur-Sleep CPAP Aromatherapy may be the product for you. Can you Add Essential Oils to CPAP Humidifier? It's recommended that a customer not try to put essential oils in CPAP humidifiers directly. Instead, the recommended way to add CPAP aromatherapy to CPAP therapy is by using a filter such as this one. Putting scented oils in the humidifier can cause irritation and can damage the machine, and is not recommended. CPAP.com will refund your money (excluding shipping costs) within 15 days of your purchase, no questions asked. To use essential oils, twist open the cap, place one diffuser pad (either side) on top of the bottle. While holding the pad firmly in place on top of the bottle, quickly invert the bottle/pad and return it to its upright position. This dispenses one drop of oil. Test for strength. A small amount of concentrated essential oil goes a long way, generally only a single drop is needed. Repeat as desired. Replace the cap tightly and store out of direct sunlight and away from heat. Place the diffuser pad in the slot on the diffuser tray stand and place at the air intake of the machine. Avoid getting the essential oils on finished surfaces. When done using the machine, store scented pads in the mini zip-lock bags. Write the name of the aroma on the bag and re-use the same pads with the same aroma. It is not necessary to wash the pads but they may be hand washed and air dried as desired. Diffuser pads can be reused as long as they continue to hold the oil. 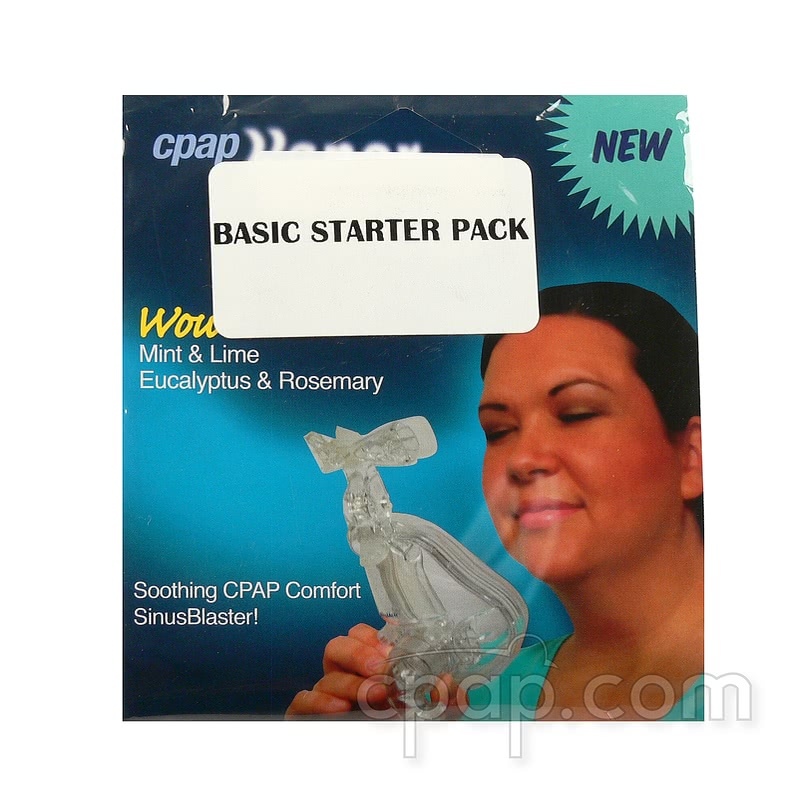 Packaging Note: The packaging the manufacturer uses for this product, Aromatherapy for CPAP Machines Basic Starter Pack, is the same as that used for the CPAP Vapor Clear Sinus Blaster. Please check the contents of the package to verify receipt of the correct item. Sample Bottle Fill Level: Please note that the 1ml sample bottles will not be completely full. They are approximately half full to help prevent leaking during transit. There is still 1ml of fluid in the bottle at this fill level. Refills: Found a scent you really like or want to try another aroma? We carry refills in the 15ml size elsewhere on our website. Want to Try a Different Sample? To receive a free sample without placing an order, send a list of any fragrances you would like to sample and provide a mailing address to sales@pursleep.com! Can you add essential oils to CPAP humidifier? It's not recommended that anyone try this, for a couple of good reasons. First of all, essential oils in the humidifier tank can cause severe irritation to the nose, throat, or mouth as you're constantly breathing this in over the course of the night. Second, essential oils can damage the components of the machine, causing it to malfunction or break. A better idea is to use the Pur-Sleep CPAP Aromatherapy Basic Starter Pack, which puts the CPAP scents on a filter that attaches to the end of the hose and delivers the aromatherapy that way. Adding CPAP aromatherapy in this manner enables the customer to get the benefits of the therapy, without exposing the CPAP machine to possible damage. 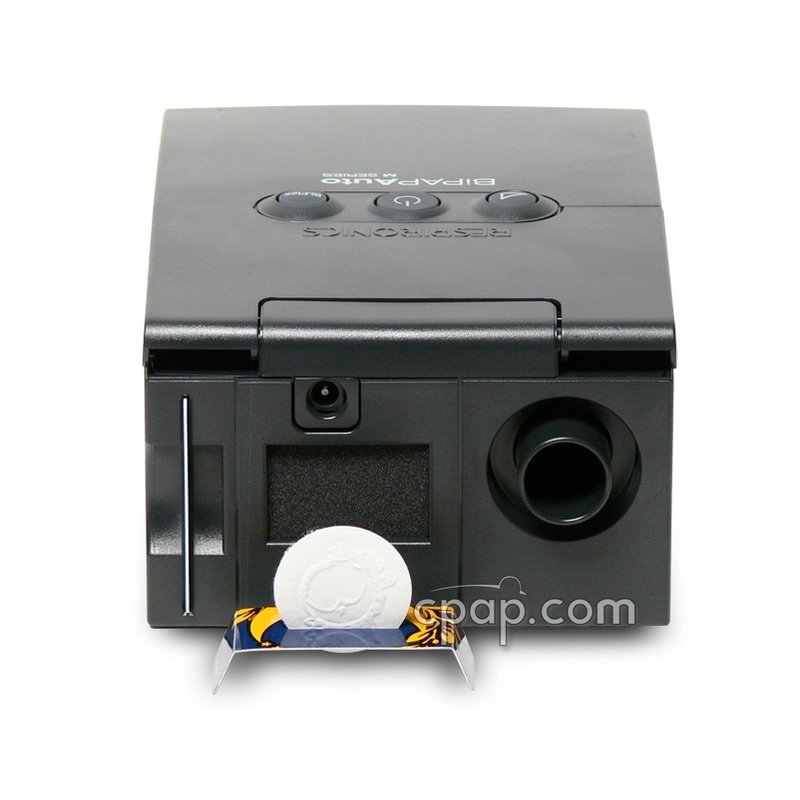 This product is compatible with all CPAP and BIPAP machines. The Pur-Sleep System releases a minute amount of fragrance into the air prior to being taken into your CPAP/BIPAP machine. Place the diffuser near the air-intake and turn your machine on. What does "Calm" smell like? The Calm scent is made from a blend of eucalyptus, French lavender and rosemary. A natural menthol cooling sensation helps soothe and relax users. Calm has no camphor, but provides a mild natural menthol cooling sensation. What does "Comfort" smell like? Well-known for its comforting and sleep-enhancing qualities with sweet marjoram essential oil this scent is warm, herbaceous, nutty, and highly comforting. Also, it is quite rare and expensive. Combined with pure lavender essential oil it creates a unique and pleasant aroma that is designed to help promote a deep and comfortable sleep. What does "Dark Chocolate" smell like? If chocolate is your love, then the Pur-Sleep Dark Chocolate fragrance will satisfy your chocolate urges. Like all Pur-Sleep fragrances, mix and match for an olfactory bonanza! Use Dark Chocolate with Bubblegum to make your very own Banana Split. What does "Deep" smell like? Cool, relaxing, and calming are how many people describe this blend of lime, sweet basil, and clary sage. Lime essential oil is well-known for its sedating and relaxing qualities. The aroma can be described as herbaceous, crisp, pleasant, warm, and sweet, with a hint of black licorice and spice. What does "French Vanilla" smell like? French Vanilla sets itself apart from the Creme scent. French Vanilla is lighter with a strong presence of the vanilla bean. CPAP users will find Vanilla promotes a calm, relaxing state of mind ideal for therapy effectiveness. What does "Fresh" smell like? Described as soothing, sweet, warming, and comforting, this blend of 100% pure Italian tangerine essential oil blended with a hint of lime essential oil is lighter and more candy-like than sweet orange botanicals. You will appreciate this scent if you enjoy the tangy, yet sweet, aroma of tangerines or mandarin oranges. What does "Peaches" smell like? One of the leading choices when customers participate in trials, the Peach fragrance wins. The scent is very calming and pleasant to the olfactory senses. Experience a true peach smell that is light, but not as strong as some of the other fragrances and essential oils from Pur-Sleep. Blend with a drop of French Vanilla for a Peaches 'N Cream CPAP bedtime treat! What does "Rosa" smell like? Pleasant and relaxing, there is nothing like the delicate smell of roses. Rosa is a blend of palmarosa and geranium essential oils created with aromatic qualities similar to the smell of roses. What does "Strawberry" smell like? This fragrance carries a long lasting smell of a strawberry patch! The scent is light and every breath fills with persistent strawberry smell. Enjoy dreams about springtime, deserts, and your childhood. Great for any kid, young or old. What does "Spice" smell like? A combination made from pure essential oils of sweet orange, real cloves, and Bay Rum; clove-like oil from the East Indies. It presents a fantastic sweet orange and spice aroma that is quite nice in the CPAP machine. “Spice" is their best-selling essential oil.